The app lets you check the details of a given artist, album and song. The details include images, biography, tracks, similar content, lyrics, etc. Its main goal is to scrobble music to last.fm website. Besides from scrobbling the app updates your now playing status on the site. This app tracks down the songs that you heard while the app was not open to scrobble them back to last.fm. If in a given moment you can't reach a data connection, no problem the app saves your playlist to sync later. You can share your favorite artist, album or song into your social networks at a cost of a simple tap on your screen. 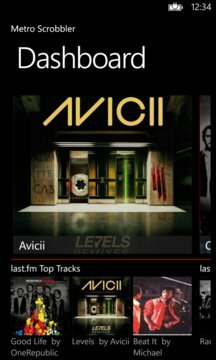 You can even pin some artist, album and song into your start screen for easy access to, for example, lyrics on a given song or details about your favorite artist. 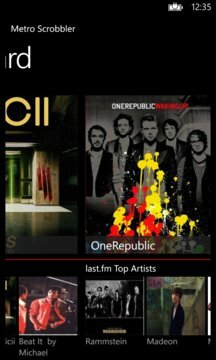 Search any kind of artist, album or song, use the awesome black live tiles and personalize your social sharing message.